December 21 1908 -- Britain may be calling boxer Freddie Welsh back home, but they're going to have to wait more than half a year yet. Freddie Welsh is about to embark on a tour of the eastern U.S. looking for good fights in his weight class. Here's a 1905 postcard by R.F. 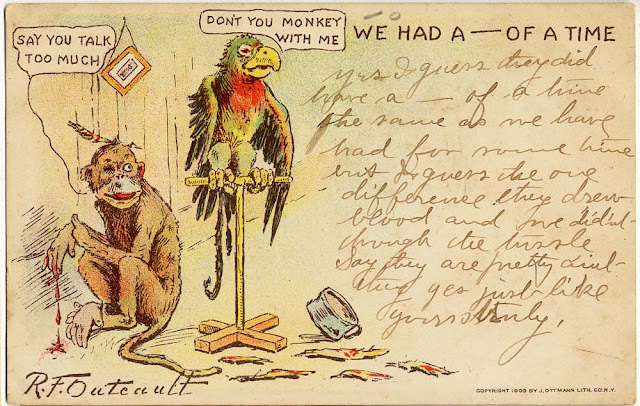 Outcault, in which a monkey and a parrot have a heck (yes, I came right out and said it!) of a time. 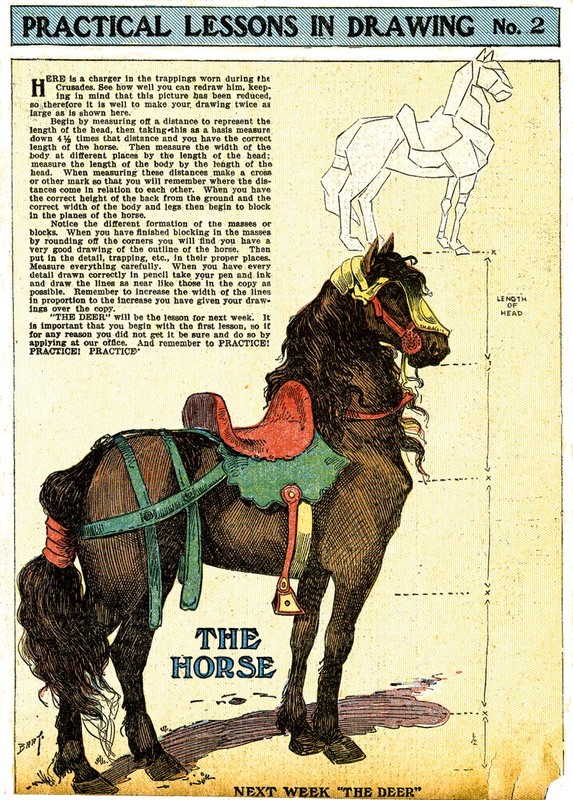 It is copyrighted by the J. Ottmann Litho Co. of New York on the front, and the undivided back has no further information. Gosh, I wish I could figure out what that word is in the note -- "Say they are pretty ???? yes just like yours truly." I feel like I'm missing a vital piece of data here. Harold David “Dave” Quinn was born in Toledo, Ohio on October 2, 1926, according to the Social Security Death Index. In the 1930 U.S. Federal Census he was the fourth of six children born to Robert and Lovie. His father was a laborer. The family lived in Toledo at 227 Oakdale Avenue. He attended Waite High School for three years and finished his senior year at Scott High School…[and] graduated...in 1944. Mr. Quinn played…on his high school football teams, earning an athletic scholarship to Wilberforce University. He attended…college briefly and then was drafted in the U.S. Army Air Corps. He was a gunner on a bomber in the Pacific Theater. After the war, he returned to Toledo and attended the former Laingor Commercial Art Studio & School in downtown Toledo, graduating in the late 1940s. Swing Papa [Comic strip by] Dave Quinn [and] Owen Dell Shaw [pseudo.] (In The Toledo Sepia City Press) © Story Script Syndicate. © 3Apr48; B5-5591. …Swing Papa was featured in the Toledo Sepia City Press, a black independent newspaper, and was syndicated with the Story Script Syndicate….Swing Papa appeared in consecutive issues of the newspaper from April 2, 1948 to August 7, 1948. The creators of Swing Papa were Harold Quinn, a Toledo World War II veteran, and O'Wendell Shaw, former editor of the Ohio State News and current editor of the Toledo Sepia City Press. …In the short span of the Swing Papa series, bandleader-hero Bret Harvey travels by train and taxi cab through the streets of Toledo, his main romantic interest is Marta Grayfield, and he is opposed by two robbers who serve as adversaries and assisted by police who act as his allies. Swing Papa includes elements of adventure much like Steve Canyon but somewhat downplayed because of the romance formula also used. Quinn worked at the former Ace Sign Co. for 20 years. He was vice president and co-owner of the former Creative Arts and Signs, which specialized in signs, art, and truck lettering. He owned his own business—Dave Quinn and Associates—during the 1970s. ...He retired [in] the 1980s, his brother, Lawrence Quinn, who is a draftsman, said. 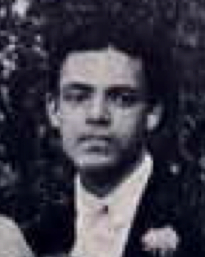 Quinn passed away on July 29, 2001, in Toledo, where he was buried at the Historic Woodlawn Cemetery, according to the U.S. Veterans Gravesites at Ancestry.com. In 1909, the World Color Printing Sunday comic section seemed to experience the defection of many long-time contributors, leaving the company occasionally scrambling for content. Surely otherwise they would not have accepted a new feature they added to the back page titled Practical Lessons in Drawing. The quarter-page feature was written by an uncredited but certainly self-important author who seemed oblivious that he was writing for a Sunday comics section, rather than a college-level academic drawing course. The result was both dry as dust and close to useless as an introduction to drawing. 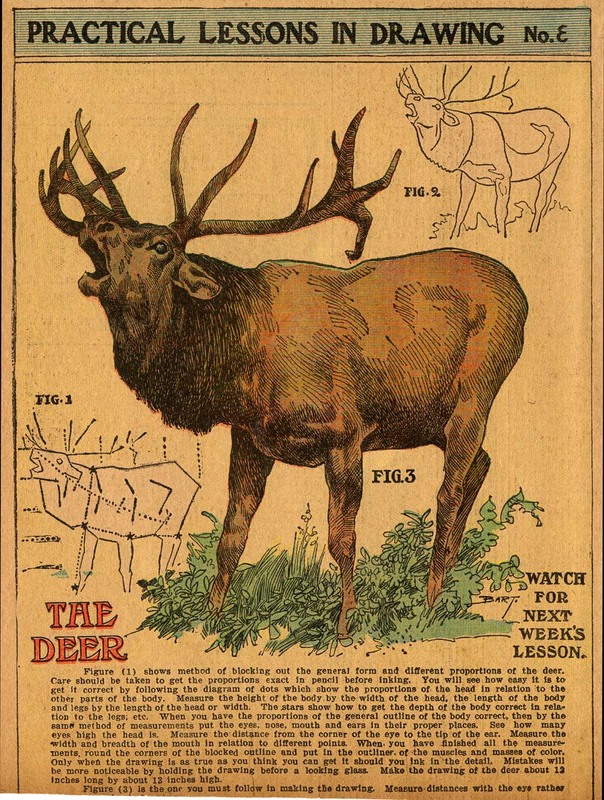 The author loved to expound on what I'll call the algebraic aspect of drawing -- a deer's head is exactly so many times the length of it's body, and the head is exactly so many eyes high, and the horns on its head are exactly so many times the length of a flea on its back, etc, ad absurdum. It surely made the author feel rather chuffed, but I can't imagine too many kiddies opening the WCP Sunday funnies and getting excited to learn the intricacies of drawing a Hindu Water Carrier (believe it or not, that really was a lesson). Most lessons ended by admonishing the kiddies in no uncertain terms to learn the lessons in order or be left with a woefully bad education. Apparently it is very important, I gather, to become expert in drawing, say, a brown bear before one tries to draw a dog. We may shudder to think of the consequences if the kids did not follow this important rule. The author helpfully told his class that if they had missed a lesson that they should run down to their local newspaper's office, where the editor would be delighted to hand out missing drawing lessons from old editions of the paper. The feature began on October 3 1909 and ended, after missing a couple weeks near the end, on March 13 1910. Apparently the author didn't realize his course was coming to its end, because the final installment tells students to look for another installment next week. WCP had other ideas, though, and dropped the feature in favor of a quarter page of puzzles and games. 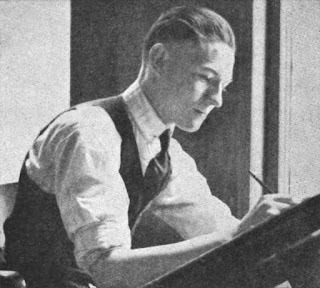 Art for the feature was mostly supplied by D.C. Bartholomew, who exhibited an unexpectedly fine ability to do straight illustration. He was spelled a few times by others, on November 14 1908 by T. Benjamin Faucett, and on November 7 and 21 by someone who signed themselves only "W". 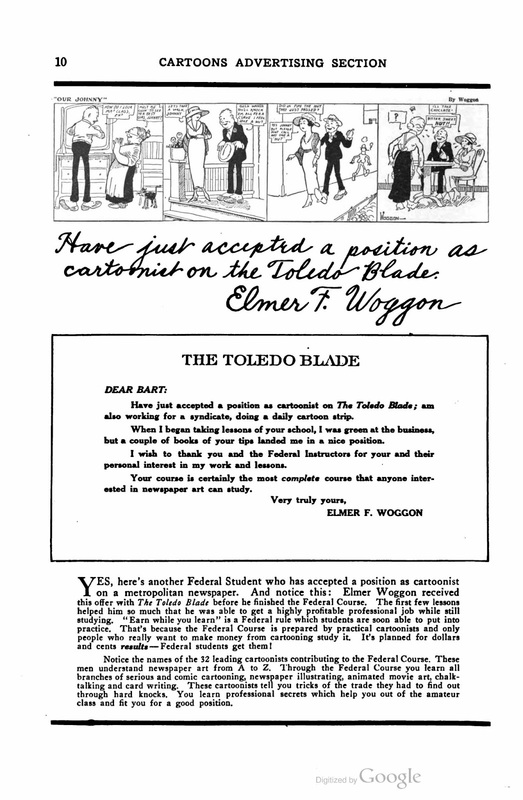 Elmer Frank Woggon was born in Toledo, Ohio, on November 4, 1898, according to his National Cartoonists Society (NCS) profile. His World War I draft card had the full name. A family tree at Ancestry.com said his German-born parents were William Henry Woggon (1838–1930) and Edith Maria Mathilda Schields (1876–1953). The 1900 U.S. Federal Census recorded Woggon and his parents in Toledo at 51 Jervis Street. His father was a baker. Ten years later, the Woggon family had added two girls and the house number was 55 on Jervis Street. A 1915 city directory listed Woggon as a student at 55 Jervis Street. The Toledo Blade, April 10, 1978, said Woggon graduated from Newton Elementary School. According to a 1916 directory, Woggon was a clerk in his father’s bakery. The next year, Woggon worked at Milner’s as a clerk. 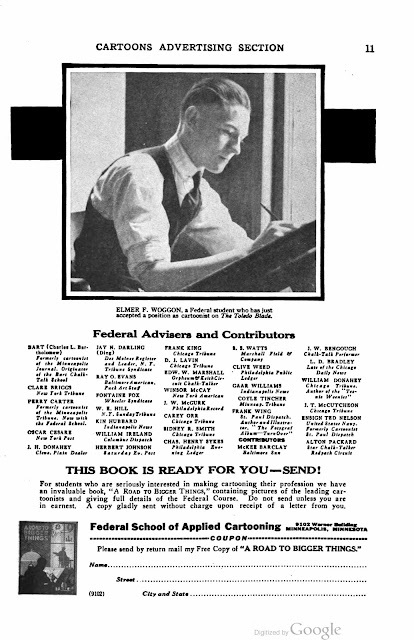 Woggon was a Multigraph operator in the 1918 directory. Woggon signed his World War I draft card on September 12, 1918 and continued to live at home. He was a multigrapher at L.A. Miller-Willys Overland. Woggon was described as tall and slender with gray eyes and light hair. Woggon’s NCS profile said he was a student of the Landon and Federal art programs. Woggon was featured twice, in 1919 and 1921, in Federal School advertisements published in Cartoons Magazine. 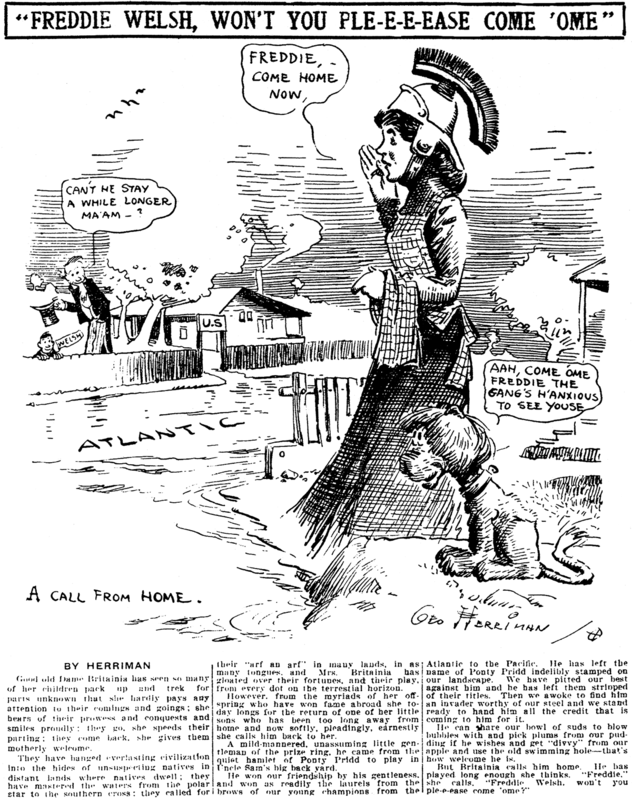 In the 1920 census, newspaper cartoonist Woggon was the oldest of six siblings. The 1923 city directory listed Woggon and his wife Wanda at 55 Jervis Street. Their address in 1924 was 1602 Wellesley Drive and was unchanged in the 1930 and 1940 censuses. American Newspaper Comics (2012) said Woggon drew and Eddie Stinson wrote Skylark, which ran from October 8, 1928 into 1929. Woggon collaborated with writer Allen Saunders to create Big Chief Wahoo which was originally titled The Great Gusto. Woggon’s tenure began November 23, 1936 and ended July 10, 1954. Ghost artists included his brother Bill Woggon, Don Dean, Pete Hoffman, and Wayne Boring (per Alberto Becattini). Other artists continued the series. W.C. Fields was a fan of the strip according to Parody as Film Genre: “Never Give a Saga an Even Break” (1999). Field’s film, My Little Chickadee (1940), featured an Indian sidekick. A Big Chief Wahoo topper, Indian Slango, is here. The Blade, February 23, 1942, reported the home invasion at Woggon’s new home, 1650 North Cove Boulevard. Woggon remarried to Helen E. Walrath according to the Blade, March 23, 1946. All of Woggon’s brother were Blade artists. Bill was the artist of the Katy Keene character. John worked in the advertising art department. And Glenn was with the art department. The Blade said Woggon moved to Fort Lauderdale, Florida in 1950. Woggon passed away April 9, 1978, at his home in Fort Lauderdale. His death was reported the following day in the Blade. 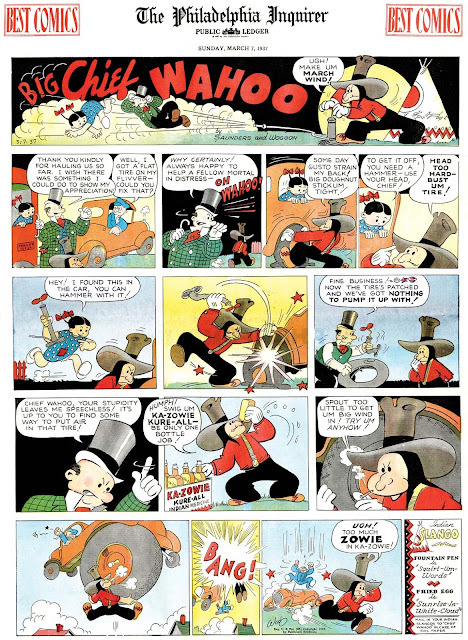 When the new feature Big Chief Wahoo was introduced in 1936, it's slapstick shenanigans were light-years away from what it would untimately become -- the hard-boiled adventure strip Steve Roper and Mike Nomad. It featured a W.C. Fields rip-off character, The Great Gusto (who was originally meant to be the star of the strip), a wacky Indian, Big Chief Wahoo, who embodies just about the ultimate in bad stereotyping of Native Americans, a kid tag-a-long, and soon enough, the beauteous Minnie Ha-Cha, an Indian princess. The broad humor written by Allen Saunders and the simple art supplied by Elmer Woggon, seem not likely to have become a big hit, but somehow it did. And when the strip began to falter a bit, Saunders wasted little time in rejiggering it for whatever genre he fancied would keep the strip in papers. Thus did the strip become not only enduringly popular, but a great subject for trivia quizzes. The topper panel Indian Slango, which was usually just a little text box as seen above, is barely a footnote to the complicated history of this comic strip. The panel featured Chief Wahoo's colorful terms for everyday things. As a commentary on Indian names, it was disrespectful I suppose, but Saunders actually came up with some pretty darn colorful and whimsical little zingers, as seen in the sample above. Unfortunately, Indian Slango was mostly made up from reader submissions, and you sure could tell why Allen Saunders got paid, while his readers didn't. 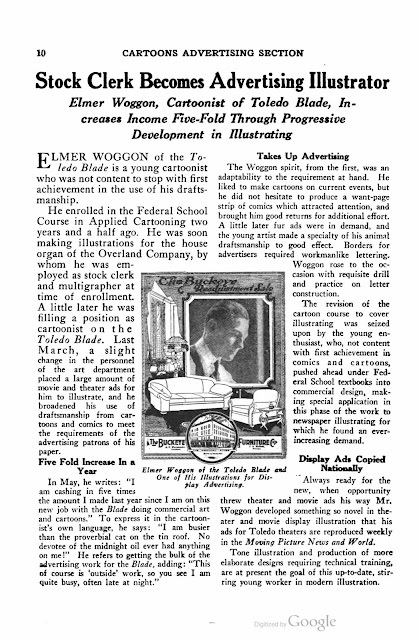 Indian Slango debuted with the Sunday page on January 10 1937. Eventually it would share space with several other panel features, one of which, Big Chief Wahoo's Dizzy Dictionary, sounds identical but was actually a rebus feature. Indian Slango was the last of these panels to appear on the Sunday page, on April 28 1940.